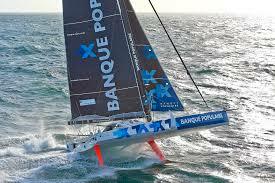 The Vendee Globe sailing race is ongoing at the time of writing. Those that are ‘in the know’ have been glued to the internet. The current race is fast, very exciting and in its closing stages. It has been brilliantly covered by the internet and the Vendee Globe organizers. The author is going to encourage you to get involved and to explain what the Vendee Globe is all about. Lots of people have asked what is the Vendee Globe? Simply put, the race is one of the toughest sailing endurance races for single-handed sailors. It goes around the world and requires the participants to sail non-stop and without assistance. This is a real feat of seamanship and navigation since the rules prevent helping the skipper with customised weather or routing information. The boats are large racing monohulls – the Ocean 60 class and the current race has 29 competitors from 10 nations. The race starts at Les Sables d’Olonne in Vendee, France and goes South through the Atlantic. Competitors then turn left below Africa’s tip (the Cape of Good Hope) and travels through the tempestuous Southern Ocean circumnavigating Antarctica whilst remaining South of Australia and New Zealand. The participants then round Cape Horn on the Southern Tip of Chile and race back up the Atlantic to the start point. Every race there is a high attrition rate and boats are forced to retire due to the extreme conditions that break equipment and test the participants and their craft to the limit. Boat speeds can routinely exceed 20 knots and needless to say the race soon spreads out. The current distance between first and last is over 9,000 miles. Through its history the race has been heavily dominated by France. Every winner of the race has been French. The Brits have also been challenging competitors with well-known sailing names Ellen McArthur (2nd in 2001), Mike Golding (3rd in 2005), Dee Caffari, and Tony Bullimore amongst others. In this years race and currently in second place we have Alex Thomson. This plucky Brit is sailing in his 3rd Vendee Globe he came 3rd in 2013 but did not finish in the preceding two races. The current race is led by Armel Le Cléac’h who has just crossed the equator and is ahead of Alex by a little over 130 miles at time of writing. With only 2,500 miles to go as they charge northwards up the Atlantic its close – very close. This edition of the race is also the first to feature foiling boats, monohulls equipped with hydrofoils. The foils are shaped like an upturned wing that project from the side of the hull allowing them to maintain speed without heeling at too great an angle. The speeds achieved with foils are significantly faster than boats without them when the wind is on the beam. This race is being closely watched to see the durability of foils in such circumstances. Alex Thomson lost his starboard foil in a collision with an unknown object in the first half of the race. Despite this he has led for the first half of the race and is currently a nail-biting second. 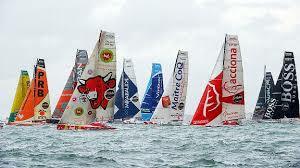 The first Vendee Globe race was in 1989 and since 1992 it takes place every 4 years. The current 2016-17 race started on Sunday 6th November 2016. It is due to finish in a matter of days. The best guess of a finish date, subject to weather conditions, is estimated between 16th -19th January. Just over 90% of the race is over. So with a nail-biting finish in sight now is the time to get behind the race and check out Vendee Globe and the race tracker on Alex Thomson Racing. “Vendee Globe”. Wikipedia, The Free Encyclopedia. Wikipedia, The Free Encyclopedia, 2 January 2017. Web 07 January 2017. Lovesail.com is a global online dating and social networking site for sailing enthusiasts. Meet for dating, friendship and crewing opportunities. A premier selection of worthy craft and crew are once again preparing to test their seafaring mettle against anything that nature and man can throw at them during an 811 nautical mile race from Port Everglades, Florida to Montego Bay, Jamaica. The battle of skill and endurance set to begin on February 6 will pit newcomers against veterans, and both against the ocean. For the victors waits the honour of holding aloft the prized Pineapple Cup, and for all, the warmth and hospitality of the very festive Jamaicans. Established in 1961, the Pineapple Cup race has been eagerly and hotly contested by participants with some very impressive credentials. Return contenders Ted Turner, Sir Peter Blake and Roy Disney are just three illustrious names to have appeared on previous winners boards, with Ted Turner having accomplished the feat on three occasions with three different boats. According to Ken Batzer, the chairman of the Pineapple Cup race, part of what keeps the big names from returning is the fact that land can be sighted for almost the entire contest, offering some magnificent scenery. There is also the record of 2 days, 10 hours, 24 minutes and 42 seconds set in 2005 by Titan 12 just begging to be broken. The Pineapple Cup race is open to various divisions and classes of ocean racing boats that are skippered by a member of a recognised yacht club or national authority. The largest competitor in the 2015 race will be the 72-foot Shockwave that previously won the overall honours, as well as coming top in her division. With many of the other boats measuring a mere 40 feet, the Pineapple Cup race will certainly provide the measure of the men in charge of plotting their course to the finish line. One contender who is more than willing to get into the ring with the bigger boys is Michael Hennessey who lost both of his ‘kites’ with 300 miles still to go in 2013. As a lover of boxing analogies, he has prepared the same boat for, what he hopes, will be a triumphant rematch against heavy hitters like the Donnybrook this year. At the very least, competitors will be vying for the Jamaica Tourist Board Log Award, which will go to the boat that has the most interesting entries in its log. Should no laurels be won, there are the post-race week-long celebrations as solace. The Baja HaHa Cruisers Rally is an exciting sailing event that takes place every year in the month of October. 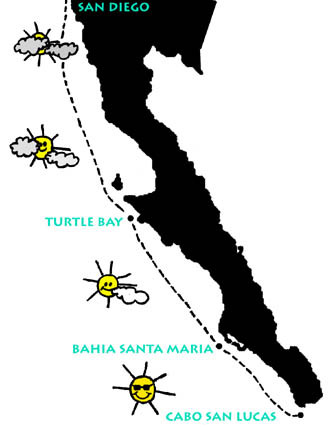 The race runs from San Diego all the way to Cabo San Lucas and there are stops at both Turtle Bay and Bahia Santa Maria. Consequently the race has three legs, with the first being approximately 360 miles, the second 240 miles and the third 180 miles. The event is specially timed so that even the slowest boats will be able to pause for around a day and a half at each stop, allowing the crew members plenty of time to sleep and refresh themselves before continuing the next stage of the rally. This year, the Baja HaHa Cruisers Rally will be held on October 26th until November 8th. This will be the 21st annual race, as the first ever event was held back in 1994. Since the Baja HaHa Cruisers Rally was established nearly three thousand boasts have taken part in the race, with a combined total of around ten thousand crew members.In order to qualify to take part in the Baja HaHa Cruisers Rally, boats have to be between twenty-seven and one hundred and twenty-five feet long and have been specially designed and maintained for strenuous offshore sailing. These boasts must be capable of maintaining an average speed of four and a half knots either under sail or engine. Each boat must have a crew of at least two people, and all crew members need to be in good physical condition and experienced sailors.Unlike traditional races where the main purpose is to be the first to reach the finish line, with this rally the pace is much more relaxed and the emphasis is on fun. Although some crews work hard to beat the other boats in their class, most take the opportunity to enjoy a pleasant sail down the coast. In addition, crews are allowed to use their engines if they wish instead of relying simply on wind power, and crews can even choose to anchor for the night at Isla Cedros or Isla Guadaloupe to make the trip even more enjoyable. The sailing conditions during the rally are typically light to moderate following winds accompanied by small to moderate seas. This makes it possible for most sailors to take part in the rally, even if they only have a little experience. however, it is worth bearing in mind that conditions can vary in the Pacific Ocean and it is best to be vigilant at all times. The Volvo Ocean Race 2014-2015 is underway with the crews setting off from Alicante on 4 October 2014. The race will see seven teams sail to eleven ports over nine months and clock up some 38,739 nautical miles when they cross the finish line in Gothenburg, Sweden next year. All teams will be using the Volvo Ocean 65 thus making the race more competitive. The race will be won or lost on the skill of the teams, no excuses! For more information on the Volvo Ocean Race 2014-2015 visit the official site.